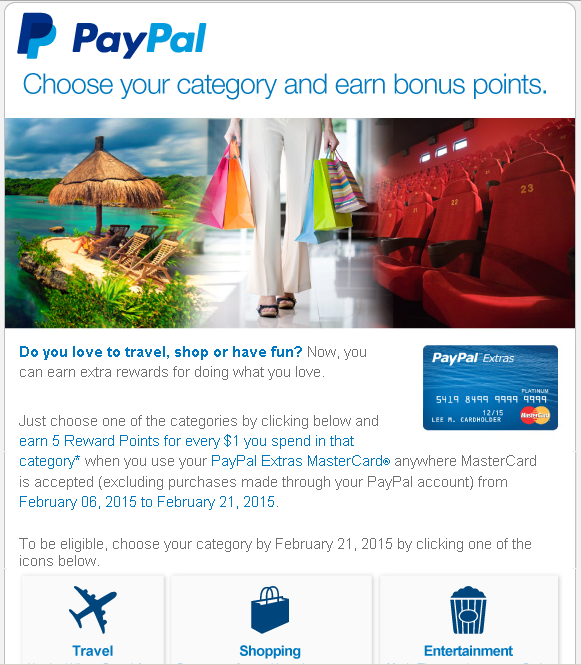 You have to use PP Extras credit card directly. Even if you buy something online at department store, when you check out through PayPal, the transaction is not qualified for 5X reward. Here is a screenshot of the email. There are the terms at the bottom of the email, but they don’t have many details such as an example of stores, exclusions, etc. At least, I’m sure that Sears is Department Store, and they have $200 Visa or MasterCard gift cards. 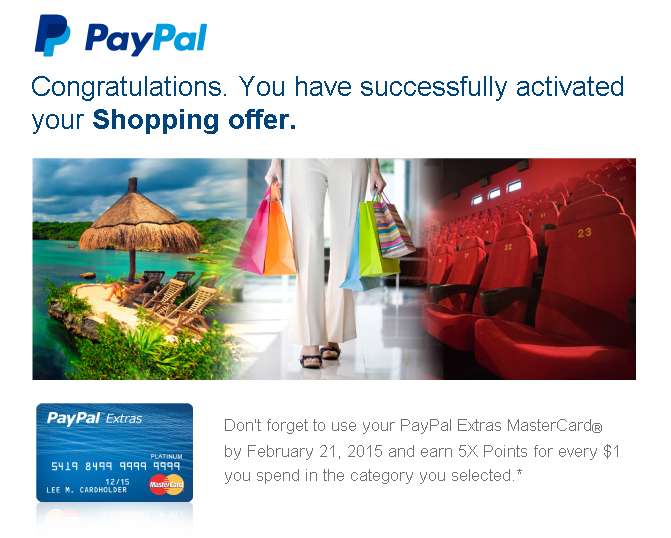 I purchased some Visa gift cards with Chase freedom in the 4th quarter of 2014 to earn 5x UR points. Now, you can do it the same with PP Extras MC. However, I’m not as appreciated for this promo as the ones that offer statement credit. That’s because the total points you can earn are limited to 50,000 a year. Unless your anniversary month is close, and you haven’t earned many points yet, you don’t have to lose $6.95 of a purchase fee for each Visa/MasterCard GCs. My PP Extras MC’s anniversary month is April, and I will be able to earn around 5000 points by April. So, I don’t have to rush. I may be going to buy HFT GCs online. HFT is a home improvement store, and shopping portals pay cash back on their GC purchases.